Our resources are centered around four key intervention strategies to address OA. 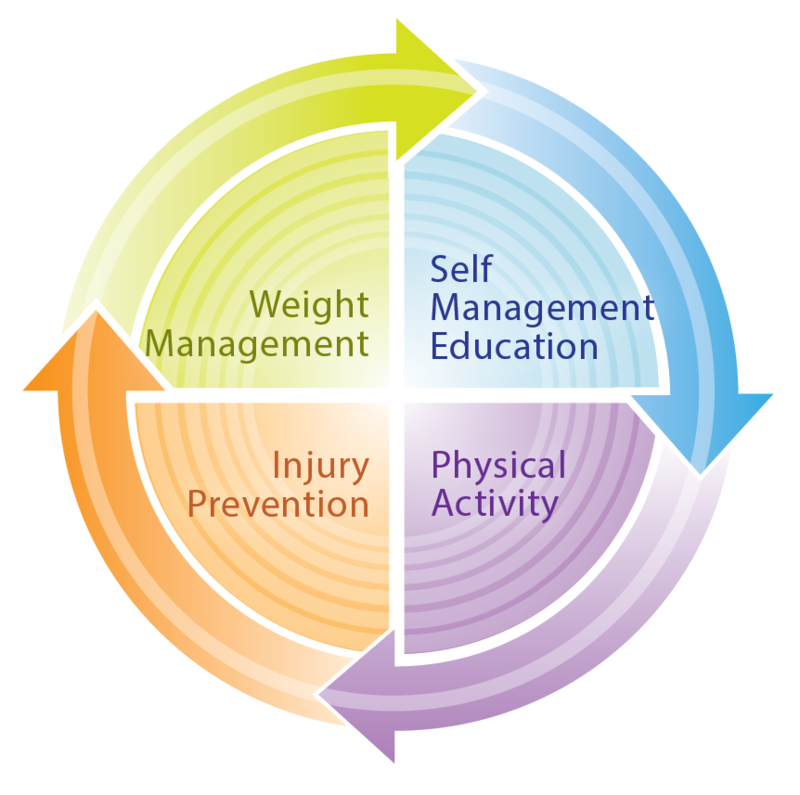 Self-management education and physical activity focus primarily on reducing the symptoms and progression of OA for those who have the disease. 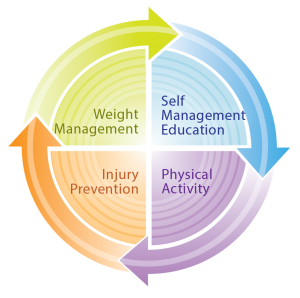 Injury prevention and weight management may prevent OA from occurring. Combined, these strategies have the potential to improve quality of life for those with OA and reduce the national burden. People who maintain a healthy weight are less likely to develop knee OA and therefore less likely to need major surgical procedures to treat OA symptoms. Higher body mass index (BMI) is not only a major risk factor for diabetes, cardiovascular disease, cancer and premature death but is also implicated as a cause of OA. For every 1 pound of weight loss, there is 4 pounds of relief on your knees. Losing 15 pounds can cut knee pain in half. Managing your weight with a healthy diet and physical activity can help you reduce your pain. But don’t try to make too many changes at once. Instead, pick just one thing you feel ready to focus on for the next several weeks. Learn more weight management tips. Injury to the knee joint, such as an anterior cruciate ligament (ACL) rupture, whether treated surgically or non-operatively, can lead to OA of the knee later in life. In fact, individuals with a history of knee injury are 3-6 times more likely than those without knee injury to develop knee OA. Down the line, almost half of individuals with an ACL injury will develop knee OA within 10 years. Participating in neuromuscular training exercises can reduce the risk for traumatic knee injury by up to 80%. Learn about the recommended exercises on our injury prevention resource page. Self-management education (SME) includes a variety of programs, usually held in the community like a local YMCA or Parks Department, help adults with a chronic condition learn how to manage their condition, prevent its short- and long-term health consequences, and achieve the best possible quality of life. CDC recommended programs include: Walk With Ease (WWE), Chronic Disease Self-Management (CDSMP), Tomando Control de su Salud (Spanish CDSMP), Active Living Everyday (ALED), Fit and Strong! and Enhance Fitness (EF). Want to enroll in a program today? Check out the Arthritis Foundation Resource Finder! Are you a community organization looking to implement one of the programs listed above? Check out our community organization resource page for implementation resources. It is recommended for adults with OA to get 2.5 hours of moderate aerobic (walking, running, etc) and 2 days of muscle strengthening exercise per week to improve pain and function. Always consult with your healthcare provider before beginning any physical activity routine, especially if you have special issues or multiple chronic conditions. Learn more about how everyday physical activity and organized exercise can improve your symptoms on our Active Living Page.